It is possible to get your husband to shop with you. And you might find that you like it if you’re willing to take the risk and invite him. I love to shop with my hubby. Now, I’m talking about clothes shopping. Groceries are a whole other matter. It’s great to have him on hand to grab a different size or color of an outfit. He’s the best at navigating the mall. And he’s so generous, he lets me get what I want within reason. But it takes some work on my part to make it happen. Incentive is the key to getting your husband to shop with you. Make a deal with him that he’s willing to accept, like you’ll take out the trash for him this week if he goes. Shop where you know he can sit and relax or read while you try on clothing. Reward him with his favorite lunch. Buy him a treat like the sports cap he’s been wanting. Give him enough notice to prepare for the long day. Keep him hydrated. Men don’t handle thirst well. Make sure he has a drink on hand. Try these tips. You might be surprised to see what a great time you can have with the man you love the most. 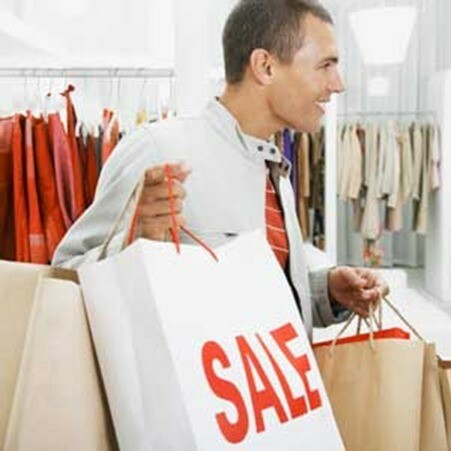 Does your husband already shop with you? Comment below and tell me whether if you love it or hate it. I do shop with my husband on occasion. Often we are the opposite of the stereotype with me bustling around the store while he meanders and stops to look at lots of things. If I’m on a time schedule, his meandering is very irritating, but when we have time to slow down, I really enjoy his company and input. My mother-in-law was the same. She could speed shop like no other because she hated doing it.